Perhaps you’ve heard. 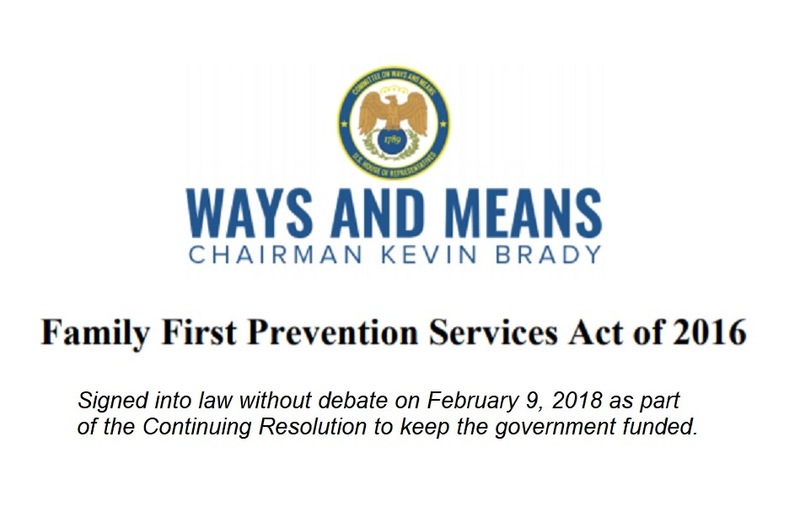 Tacked onto the bill that averted another government shutdown is a child welfare finance “reform” measure called the Family First Prevention Services Act. The bill was thought to be dead. It was killed last year by what one reformer who transformed his own institution years ago called the group home industry – the collection of private agencies typically paid for every day they hold foster children in the worst form of care, group homes and institutions -- and their public sector allies. But it came back to life as part of the process of keeping the government open. Now it’s law. One might expect advocates of family preservation to celebrate, and some almost certainly will. The bill allows some federal money once restricted to funding foster care to be used for better alternatives. And, in theory, it curbs federal funding for group homes and institutions. Some very good child welfare reformers favor the bill. But I disagree. In 2016, I wrote that the range of prevention services that could be funded under Family First was tiny, and there were absurd restrictions on which programs within that range could get federal aid. And instead of limiting group homes and institutions, I argued that the bill was so weak that it actually strengthened them, creating a whole category of institution that would be, in effect, sanctified in federal law.